You probably couldn't tell from Alyce's birthday pictures, but a few days before her birthday she got a haircut. We went to a kid friendly place this time and our experience was much better. The stylist put in a video of Finding Nemo and that kept Alyce's attention long enough to cut her bangs straight. 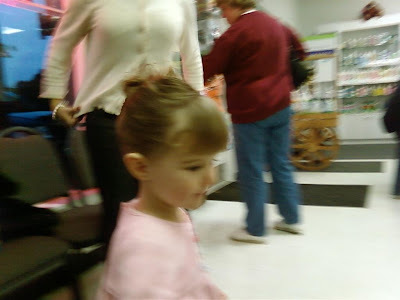 The picture is a bit blurry but shows how Alyce's hair was styled for us. I am a big fan of the up hair as it reminds me of Alyce when she was a little girl with short hair. 0 comments on "Hair Cut"